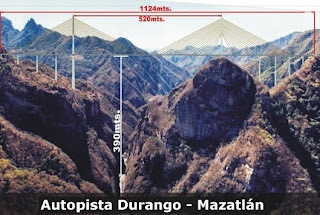 Recently, Dionisio Pérez Jácome, Mexico’s Communications and Transportation Secretary, said that the new Durango-Mazatlán highway is “80% completed” and “on schedule to be opened in the second half of next year” (2012) (Milenio online, 15 July 2011). A new 1.2 billion dollar highway between Durango and Mazatlán, with four-lanes stretching across 230 kilometers, will greatly reduce the travel time between the two cities. It's a missing piece that will make the current 5 hour-long journey, much faster, easier and efficient.